No charges after suspect killed: Rick Williams reports during Action News at Noon on November 20, 2017. KING OF PRUSSIA, Pa. (WPVI) -- The Montgomery County District Attorney says no charges will be filed against the officers involved in the fatal shooting of a suspect outside the King of Prussia Mall last month. 23-year-old Kalin Jackson of Wilmington, Delaware was shot and critically injured on October 29 after police say he rammed two police cars and tried to run down officers who were on foot. It happened in a parking garage near Gulph Road and Mall Boulevard. Jackson was considered a suspect in a robbery outside the mall which took place the day before. 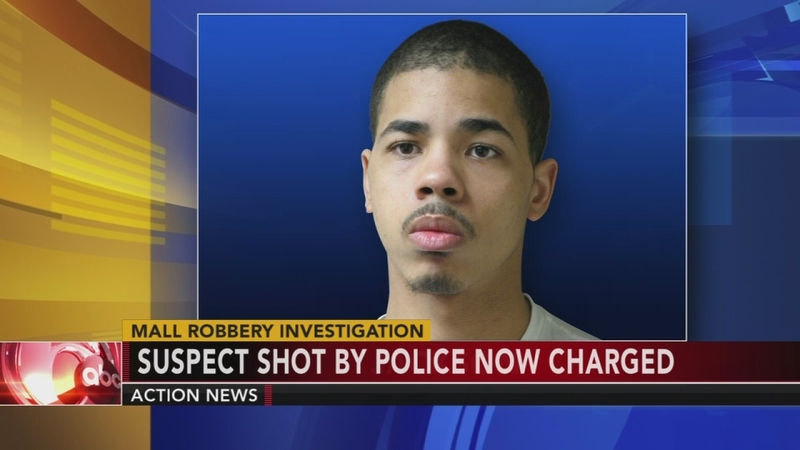 The robbery suspect shot by police outside the King of Prussia Mall over the weekend has been identified and charged. Jackson died November 7th of his wounds. "The evidence showed that this was an armed and dangerous man who was putting the lives of innocent bystanders and of the Upper Merion police officers at risk. When police located the defendant and commanded him to stop, he began ramming his vehicle into police vehicles, civilian vehicles and aimed his vehicle at officers. The officers fired their weapons at the suspect, striking him and stopping the threat to lives. Our investigation determined the facts of this case supported the use of deadly force and therefore did not warrant any criminal charge against the officers involved." Both Upper Merion police officers were placed on administrative leave after the incident. They have been cleared to return to active duty.